I tested it on my iMac (2009 early version) with Mac OS X Mavericks (10.9). According to some readers’ feedback, it may not work on some new Mac machines. I will investigate it and update accordingly. If you have the development kit for Raspberry Pi compute module, you can follow this document on the Raspberry Pi foundation website to flash the eMMC on your compute module. However that document assumes you have another Linux machine (e.g. another Raspberry Pi) running as a host to write the raw OS image into the eMMC, what if you don’t have one? Well, if you have a machine that has Mac OS installed, you can still make it, and this tutorial is going to show you how. Mac OS is based on UNIX, so it is similar with Linux in some ways. You may already know that, the “dd” command is also available in Mac OS, so the solution is almost there! But wait, by lacking the “usbbootcode.bin” and “msd.bin” files in the eMMC, BCM2835 (the heart of Raspberry Pi) can not boot from USB, and your RPi CM will not be detected as a USB storage device, hence you don’t have the chance to “dd” it (yet). 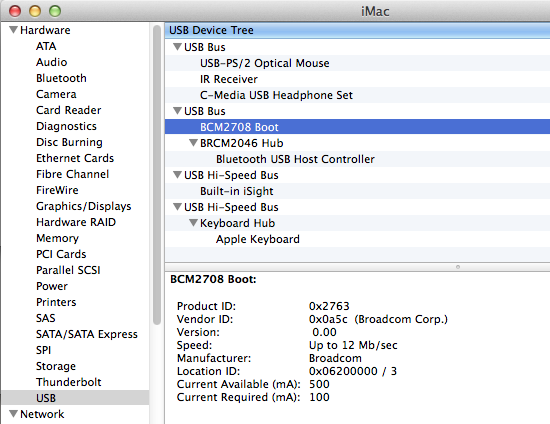 The picture below shows that Mac OS knows there is a USB device, but could not initialize it as a USB storage device. Want to know why it is named BCM2708 instead of BCM2835? You can read this. 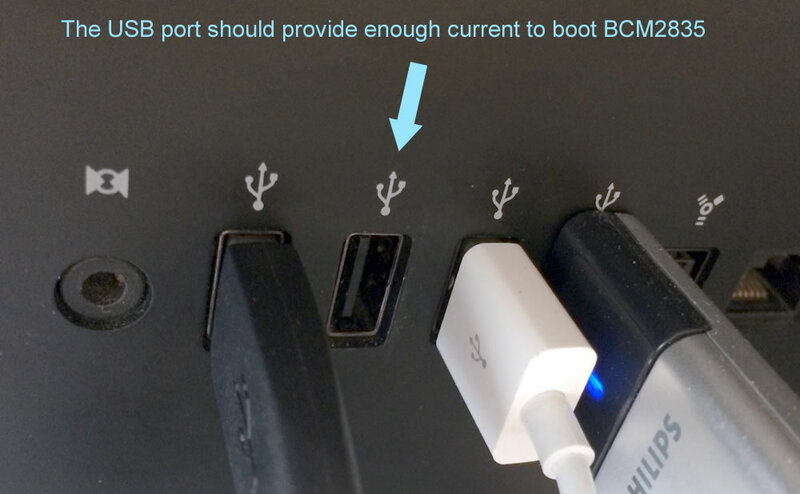 So the first task is to compile and run the “usbboot” tool on your Mac OS, which can detect your CM and write in those boot code files, so you can later treat it as a USB storage device. This time you should not see any error and you will see the “rpiboot” file is generated. If rpiboot still doesn’t recognize your BCM2835, the first thing to check is the USB port you connect your I/O board to. 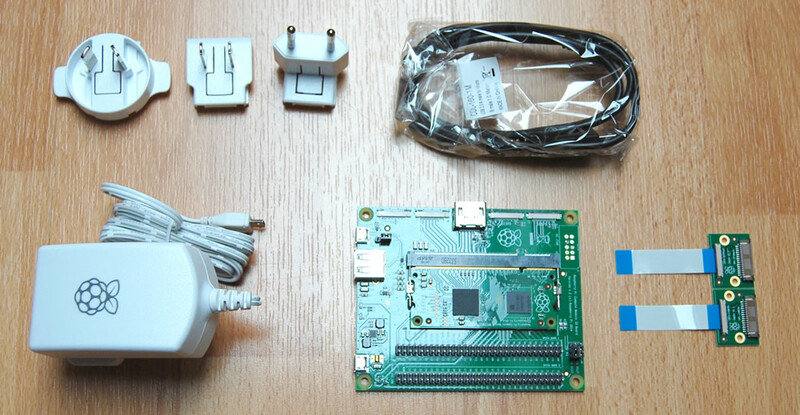 Booting from USB will need to draw certain current from your host USB port, so if the USB port could not provide that current, the booting will fail and thus rpiboot tool could not see your RPi CM. 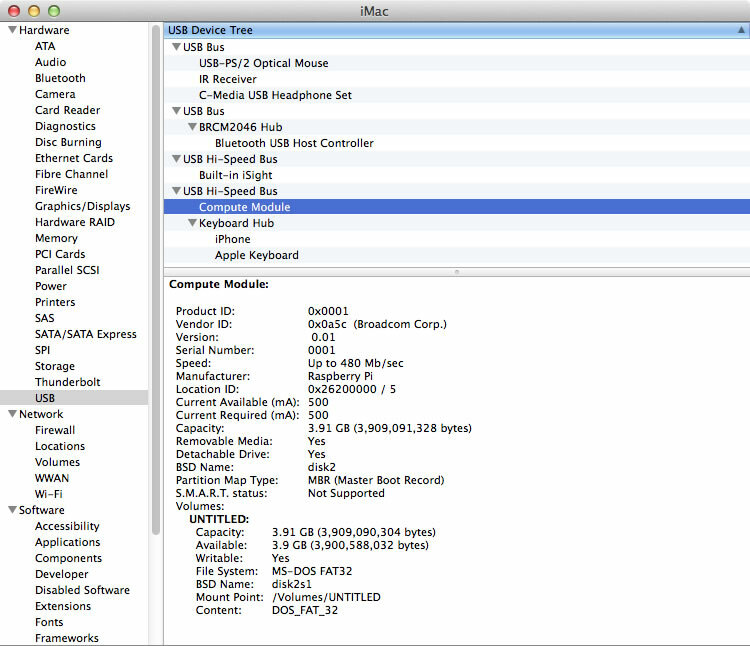 On my iMac, I noticed that connecting the I/O board to the USB port on Apple keyboard doesn’t work, while connecting to any USB port on the rear of iMac can work. If everything goes right, you will soon see a new device appear in your Finder, and you can treat it like a normal USB storage device. Because the eMMC has the boot code files now, you don’t need the help from rpiboot tool any more. Next time when you connect your I/O board to your PC, it can be directly recognized as a USB storage device. Please be patient as it will take some time. On my iMac it took 22 minutes to finish the writing. 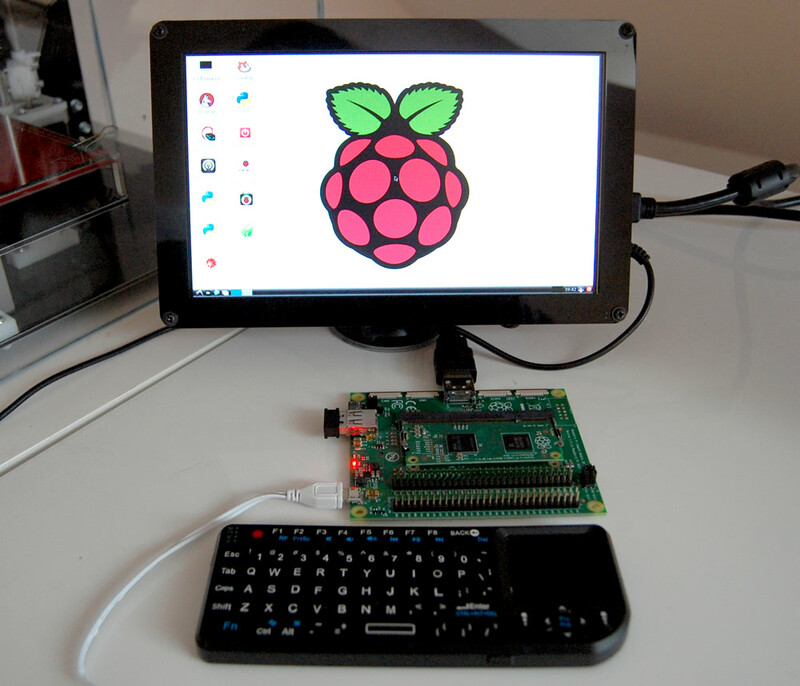 After it is done, the OS is installed into the eMMC and you can unplug the USB slave port and reboot your Raspberry Pi Compute Module. Congratulations!